Founded on the campus of Howard University in Washington, DC in 1908, Alpha Kappa Alpha Sorority is the oldest Greek-letter organization established by African American college-trained women. To trace its history is to tell a story of changing patterns of human relations in America in the 20th century. The small group of women who organized the Sorority was conscious of a privileged position as college-trained women of color, just one generation removed from slavery. They were resolute that their college experiences should be as meaningful and productive as possible. Alpha Kappa Alpha was founded to apply that determination. As the Sorority grew, it kept in balance two important themes: the importance of the individual and the strength of an organi­zation of women of ability and courage. As the world became more complex, there was a need for associations which cut across racial, geographical, political, physical and social barri­ers. The influence of Alpha Kappa Alpha extends beyond campus quads and student interest. It has a legacy of service that deepens, rather than ends, with college graduation. The goals of its program activities center on significant issues in families, communities, government halls and world assembly chambers. Its efforts constitute a priceless part of the global experience in the 21st century. KAPPA GAMMA OMEGA CHAPTER seeks to partner with community organizations on Building Leaders for Tomorrow (BLT), in alignment with our international initiatives. Inspired by a dedicated investment of human capital and a bold commitment to the principles of basic human rights, we shall devote our talent and resources to this cause. Awareness, advocacy and action are the primary vehicles for the worldwide delivery of our service initiatives. We invite you to join us on this journey and accept this great mission: Global Leadership through Timeless Service. I. Emerging Young Leaders (EYL) Initiatives ~ This signature program will impact the lives of 10,000 girls in grades six through eight by providing leadership development, civic engagement, enhanced academic preparation and character building. The increasing demands of the twenty-first century mandate our youth to be better leaders at a younger age making smart choices with positive consequences. II. Health Initiatives ~ These initiatives encourage personal fitness and healthy life styles. We will support organizations which advance access to treatment and coordinate awareness and advocacy campaigns to reduce health disparities, save lives and impact health related legislation. Co-sponsored health forums will address: diseases which disproportionately affect women and minorities, prevention and treatment options. A. Asthma Prevention and Management Initiative ~ This signature health program will benefit children and families enrolled in Head Start and Early Head Start programs. The goal is early diagnosis, treatment awareness and parental education and advocacy. B. Environmental Stewardship and Sustainability ~ This initiative, through community forums and activities, promotes strategies and awareness campaigns to encourage energy efficiency, conservation, eco-living, reforestation, urban gardening, education and empowerment of consumers with limited resources, “go green-living green” eco-tourism, opportunities for women owned businesses, environmental zones in urban communities and advocacy for and legislation related to public health and environmental justice. III. Global Poverty ~ The goals for this initiative are to end hunger, preserve the environment and empower women. The program will provide food production skills and training in self-reliance through gifts of seeds, livestock and training in environmentally sound agriculture. Education in sustainable food practices will make women equal partners in ending poverty and hunger. 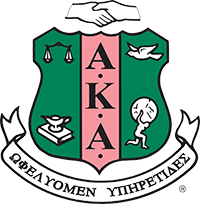 Alpha Kappa Alpha will continue its membership and consultative status with UNESCO (United Nations Educational Scientific and Cultural Organization). We have global partners for self-help projects and awareness campaigns within the United States and abroad. IV. Economic Security Initiative ~ This effort expands the current programs related to wealth building and allocation of resources, home ownership, estate planning, support and empowerment of female owned businesses and urban enterprise zones. V. Social Justice and Human Rights Initiative ~ These initiatives will address gender equality issues including: human trafficking and domestic violence, services for children with incarcerated parents, youth aging out of foster care and children in homeless shelters. Voter empowerment; access to technology; training of parents as advocates for educational and health care needs of children and support of the arts will be emphasized. VI. Internal Leadership Training for External Service Initiative ~ This initiative will afford Alpha Kappa Alpha members leadership training at all levels within the organization. It will serve as a catalyst for members to reach their fullest potential as skilled leaders in service to Alpha Kappa Alpha and other organizations and institutions. Website maintained by Triple C Designs. Alpha Kappa Alpha Sorority, Inc. is not responsible for the design nor content of these web pages. They are the sole property and responsibility of the Far Western Region or the Kappa Gamma Omega Chapter who hosts and maintains this website.